Please check out the book review on Modern Midges on this web site. The definative book on tying midge patterns so far. Midges or Chironomids as they are properly called, are one of the most important foods for trout in lakes. That does not mean they are not present in all other waters; they are, but usually are so small or difficult to fish that they most often get ignored. In lakes however, they can be very large (size 10s in some places) and hatch all year so they become one of the major food supplies for trout. Before we discuss general information, imitation, and fishing techniques for midges, I would like to add another comment. Many fishermen refer to any small or very small bugs as midges. This can take in anything from small caddis flies or mayflies to just about anything that looks difficult to tie or fish. For our discussion, we need to say that we refer to midges that are true flies and part of the Order Diptera. Chironomids are one family of this order and our focus. Midges have 3 stages in their life cycle, larva, pupae, and adult. All 3 stages have importance to the fly fisherman and should be considered when putting together your fly box. They live almost anywhere there is water and live almost anywhere in a lake or spring creek from weedbeds to debris, stones, and most abundantly in muddy bottoms. When they hatch is dependent on the air temperature and amount of light on the water. In early spring, fall, and winter, they hatch during the midday or mildest part of day. As the temperture gets warmer, they usually hatch in the early morning and at dusk. They can be very frustrating for the fly angler when many fish may be seen dimpling the surface of the water but are very difficult to catch. This difficulty has caused the development of a group of fishermen who are almost a cult. They love and seek midge fishing for good trout in difficult situations. Ok, I confess, I am one of those weirdos. I do want to also confess that with a litle work and a lot of patience, anyone can become a good midge fisherman and increase their fishing success by leaps and bounds. Midges range in size from smaller than 24 to as large as 8(wow!). I will refer to their size in hook size rather than metric numbers so most of you will be able to visualize them easier. Colors range (in abundance) from black, brown, red, tan, green, and cream. There are even many who have multicolored bodies. Interesting enough, the colors seem to be present in all stages. The red ones, often call blood worms and blood midges actually have the same pigment in them as the one that gives our hemoglobin its blood red color. Midges live in all depths of water, but usually are found in waters from 6 to 20 ft. Most midges stay in one place until it is time to hatch, but some do migrate as water temperatures change and provide some interesting fishing opportunities. The midge larvae (now really the pupae stage) riggles and moves clumsily toward the surface when it is ready to hatch. As it moves, it uses air bubbles trapped on its body which give it some qualities that we will add to some of our imitations. In addition, the pupae stops rising at intervals and even begins to sink before resuming its ackward accent. After reaching the surface the pupae hang almost vertically for some time before the adult hatches out. 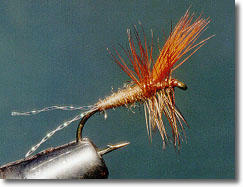 This period of "hanging" is one of the fly fishermen's best oportunities for catching trout. Depending on the species of midge, they will fly away quickly, hoping to mate, or sometimes skitter across the surface before getting enough lift to take flight. This skittering as I refer to it also lends itself to some great opportunity for anglers. Usually of little importance, but not always, the females will return to the water to drop their eggs and give the fish and angler one last opportunity. Fishing strategies vary with conditions and species of midges and reward the angler who spends some time and effort into studying the specific fishery. Larvae, particularly migrating and early stages of pre-emergance can be fun and very easy to imitate. I like to use a longer leader with a very long piece of tippet and a weighted larvae and/or a small split shot about 18 inches above the imitation. Leaders and tippets depend on depth of water, but you need enough to get close to the bottom or at least down considerably. Cast the larvae out (use an open loop if you have split shot on) and let the larvae sink until you don't want to anymore and then let it sink some more. After a while, start to retrieve the larvae by very slowly stripping in a few inches of line and then letting it sit and sink a little. This simulates the clumsy motion of a real larvae and can trigger strikes from very soft to hand jolting. Be ready, the fish you hook may be bigger than you expect. If you are using small flies, you should be using 6x and even 7x tippet, it will sink faster but is susceptible to breaking. An indicator can be helpful with this method, but is not necessary. Fishing the pupal stage can range from using pupae imitations that sink just under the surface to emergers that hang in the surface and stick out the top. One of the better methods of fishing pupae in or just below the surface is to grease your leader up to about 18 inches from the fly and cast it out into a area where fish are observed. Occasionally, strip or just move the line back and let go. This will cause the imitation to rise and sink in a natural manner. As far as emergers go, many strategies seem to work at different times. I like to watch fish feeding and cast to where "I hope" they are going to be next and just wait. Sometimes just casting right at the fish works. Be patient, this is where many anglers get frustrated and refuse to fish midges. The water is usually very calm and the fish can be very spooky, so don't rip the water and try to cast as little as possible. I have found that fishing from shore or in a tube for midging fish can be more successful than a boat because the fish seem to be boat shy. If all else fails, cast your fly out and just try to keep the line straight but don't strip. This is often referred to as the "heave it and leave it" strategy that is often very successful. Trying to imitate adult midges is often difficult and frustrating. Many general patterns like Griffith's Gnats or Poly Midges have been developed as attractors. 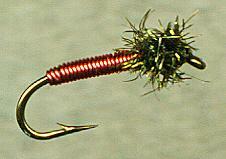 Sometimes these work well, but I usually stick with an emerger pattern and have more success. One of the better new patterns to emerge in the last 20 years is the Palamino Midge particularly if fished in or just under the surface. I always have some with me. Larvae- easily tied and sometimes consisting of just some thread or wire on a hook. To get a little more technical, try adding some gills to the tail and head ends and add a head that is a little larger than the body. I have seen some great patterns tied with quills and biots for bodies that work great but are shredded after one fish. I will use Larvae Lace or some other stretchy tubing if the imitation is 16 or larger. It has a nice segmented effect and is very durable. There are some great midge patterns in almost any fly pattern book or on the web. Check them out and try a some new patterns, it may be your key to success. Use a small hook that has a good gape. Like a TMC 2487 or whatever brand you like to tie with. Tie in a body of thread, wire, fur, quill, etc in color needed. Add a small head and gills if you want, but not needed. Thats it, they are real simple looking in real life and easy to tie. A lump of thread or one turn of peacock herl will work great as a head. Same as above, but I like to add some fluffy gills at tail and head end. In addition, I like to use heavier material for the body and rib so that the segmentation is apparent. I mentioned above that I like to use Larvae Lace or tubing in the proper color for bodies. It looks and works great and has a good segmented appearance. I probably tie a couple of hundred blood midge larvae each year in sizes 16 to 12 and my general pattern is a small strip of white poly tied to the top of the hook shank so that the ends will stick out beyond both ends of the body. Then I add a Larvae Lace body of red to dark brown. Finally, I add a couple of turns of peacock herl for a head. Remember to leave some poly sticking out beyond the head. 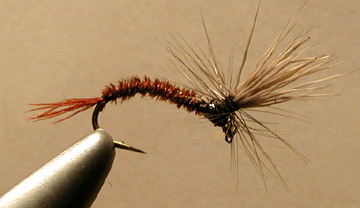 Pretty simple, but this fly catches a lot more fish for me than any wooly buggers or other attractors. Of course I fish it a lot more and really don't like stripping the attractors unless I have to. I do like to tie with traditional materials and have many different patterns in my box, but seem to gravitate to patterns that I have confidence in even if they are not as pretty. I have to confess, I like to use midge emergers that hang half under water and half above water so much I don't tie to many other pupae imitations. The above larvae imitations are really just pupae imitations if you become technical. That is, most larvae are just wormlike and by adding gills or a head you are creating something that looks more like the pupae stage. All that said, there are a miriad of suspender type midge emergers. The differences are subtle and don't change the pattern much. Before I get out of hand. I do carry some small Poly midges and Griffth's Gnats in my box to imitate very small bugs in sizes 24 to 18. For everything else, I tie the pattern below and just change body materials and sizes. Hooks- again, I like to use wider gap dry fly hooks or something like TMC 2487s. There are lots of great hooks out there and I don't want to sell you on anything specific. I actually still have some Mustad hooks that work great! Tails- use some sparse marabou or even some Krystal Flash strands (sparse) tied in to stick out about 1/2 to 3/4s of the body length to represent a shuck. I have been experimenting with different materials here. Body- I use different materials but prefer using the same marabou to wrap the body. One of my favorite ties is to use dark pheasant tail strands for the body and rib with wire for strength. Be creative, I rarely tie a fly with the same materials suggested by some article or book. I next tie in a small clump of deer, elk, or other hair and sometimes poly or foam to resemble the adult emerging out of the shuck. the wing should be tilted about 45 degrees forward to resemble the real thing. 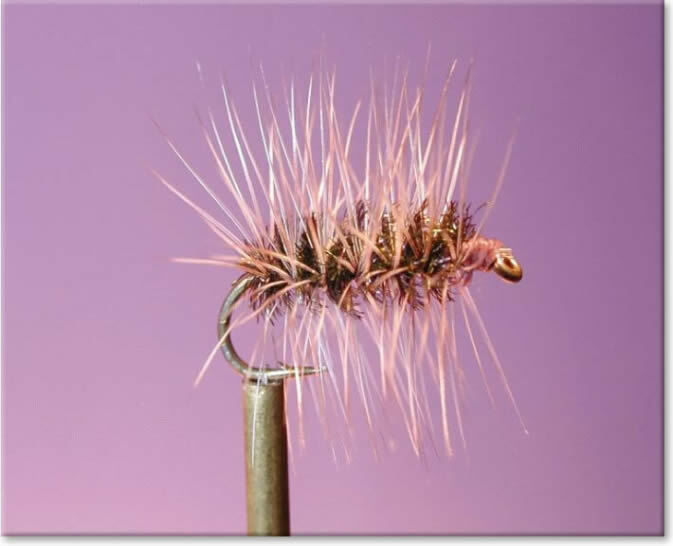 Then wrap a few turns of hackle around the base of the wing so that when placed in the water the wing and hackle are oriented upward and the body is hanging down in the water like the pupal shuck. Test one in a glass after you tie it. Make changes to get the orientation correct. Midge fishing can be a lot of fun and rewarding, so the next time those fish start dimpling everywhere at the end of the day on your favorite water. Catch some, don't pack up and miss some of the best fishing opportunities.